Our Blessed Mother Mary Magdalene of the Incarnation was born on April 16, 1770 in Italy, where she grew up in a family devoted to Jesus in the Eucharist. Caterina Sordini was born on April 16th, 1770 in Grosseto, Italy, the fourth of nine children born into a deeply Catholic family. When she was 17, her father arranged for her to become engaged to a maritime merchant. At first she was against it, but she later complied with her father's wishes. The young man gave her a casket of jewels and, having adorned herself, she turned to admire her reflection in the mirror. Instead, she saw the image of the Crucified Christ, who asked: "Do you want to leave me for another?" She took the question seriously and in February 1788 visited the Franciscan Tertiary Monastery in Ischia di Castro. Caterina entered then and there, thus shocking her father, who had thought it was merely a visit. She was clothed six months later, taking the name of Sister Mary Magdalene of the Incarnation. 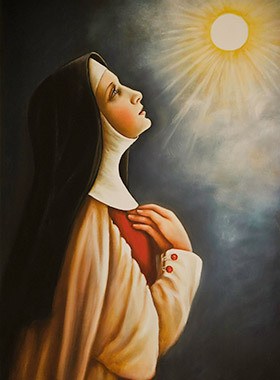 On February 19th, 1789, she fell into ecstasy and saw a vision of "Jesus seated on a throne of grace in the Blessed Sacrament, surrounded by virgins adoring him," and heard him telling her: "I have chosen you to establish the work of perpetual adorers who, day and night, will offer me their humble adoration..." Thus, she was called to become a foundress and to spend her life adoring Jesus in the Eucharist. In that turbulent period for the Church, she set an example for all. She was elected Abbess on April 20th, 1802. The period of her governance was accompanied by extraordinary phenomena and an increasingly fervent spiritual life, and the abbey thrived. With the consent of her spiritual director and the local Bishop, she drafted the rules of the new Institute and set out for Rome on May 31st, 1807. On July 8th that year, she and a few Sisters moved into Saints Joachim and Anne convent, near the Trevi Fountain. It was confiscated during the French occupation; the Napoleonic laws suppressed her Order, and she was exiled to Tuscany. There she formed a new group of Adorers. On March 19th, 1814, when they could finally return to Rome, they settled at Sant'Anna al Quirinale. On February 13th, 1818, Pope Pius VII approved the Institute dedicated to perpetual, solemn, public exposition of the Most Blessed Sacrament. Mother Mary Magdalene died in Rome on April 29th, 1824; she was buried at Sant'Anna al Quirinale. In 1839, her remains were transferred to the Church of Santa Maria Maddalena, the new generalate of the Perpetual Adorers in Rome. Pope John Paul II decreed her heroic virtues in 2001 and in 2007, Benedict XVI recognized a miracle attributed to her intercession. Since its foundation in Rome, the Order of the Sisters of Perpetual Adoration of the Most Blessed Sacrament has grown into a worldwide community with monasteries in Italy, the USA, Africa, Austria, Chile, Mexico and Spain. is the most effective representative of mankind."